Celebrate this mid-century design with us! Today we celebrate Frank Sinatra’s birthday and celebrate his legacy. Celebrate Frank Sinatra’s birthday alongside us and DelightFULL! Frank Sinatra was arguably the most important popular music figure of the 20th century, in a professional career that lasted 60 years, he demonstrated a remarkable ability to maintain his appeal and pursue his musical goals despite often countervailing trends. Sinatra finally retired from performing in his 80th year in 1995, and he died of a heart attack less than three years later. His popularity as a singer and his productivity has resulted in an overwhelming discography. Sinatra is so much of a 20th-century icon that it is easy to overlook his real musical talents. DelightFULL originated from this very own piece, the Sinatra floor lamp. An important and influential mid-century design piece that helped DelightFULL burst into the lighting design scene. 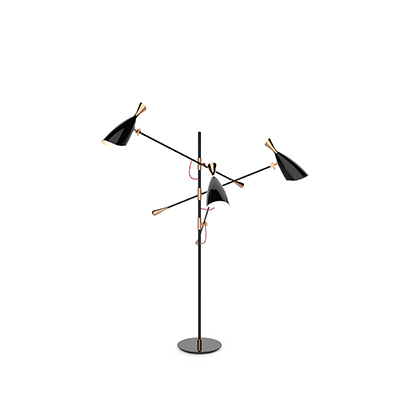 Sinatra floor lamp is one of the best mid-century design lighting pieces for any modern home decor setting. Fully handmade and customizable, your Sinatra floor lamp can be a standout piece or just blend with your home decor, the choice is yours. We also wanted to mention DelightFULL Sinatra suspension lamp. An inspired mid-century design piece that anyone can enjoy! Get that intricate and playful suspension lamp that shares the same traits as its floor lamp counterpart!